Rosenberg Library will present The Great Storm: Original Photographs from the Devastating Hurricane of September 8, 1900 at The Tremont House, 2300 Ship’s Mechanic Row, on Saturday, Aug. 28 from 6 – 9 pm in conjunction with ArtWalk. The Great Storm presents 102 images during a 15-minute PowerPoint from the Rosenberg Library’s extensive photographic archives of the hurricane. The images include panoramic views of ruin, street scenes, and photographs of survivors and relief workers. “Several images of the twin spires of Sacred Heart Catholic Church, which was destroyed in the cataclysm, are perhaps the most haunting, iconic reminders of this disaster,” says Head of Special Collections Casey Greene. The 1900 Storm is the nation’s deadliest recorded natural disaster. It claimed upwards of 8,000 lives on Galveston Island and several thousand more on the mainland. A storm surge of almost 16 feet covered every part of Galveston. Library staff will sell reproductions of historic color postcards from the Forshey Collection. In 2009, Rocky and Sherrie Forshey donated over 700 postcards of Galveston, circa 1898-1930, to the Rosenberg Library. The reproductions illustrate postcards depicting such topics as beach scenes, the Seawall, Hotel Galvez, and other Galveston landmarks. Rosenberg Library, located at 23rd and Sealy, suffered extensive damage from Hurricane Ike. The library is currently undergoing a major renovation. To make donations toward the renovations visit www.Rosenberg-Library.org or call (409) 763-8854. The Tremont House, a Wyndham Grand® Hotel, is owned by Galveston preservationist George Mitchell and part of Mitchell Historic Properties. For information call (409) 763-0300, (800) WYNDHAM, or visit http://www.WyndhamTremontHouse.com. 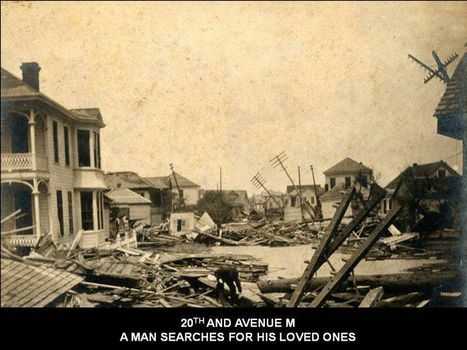 A man searches for his family in the vicinity of 20th Street and Avenue M, September 1900.